For Earth Networks Senior Meteorologist, Manager, Julie Gaddy, forecasting the weather is like one big puzzle. And she likes it that way! Julie has been a meteorologist for 22 years and spent half of those years at Earth Networks. As with many of our meteorologists, Julie’s interest in the weather started at a young age. When she was a child Julie spent a lot of her free time reading books about the weather. She also had her fair share of real-world experiences with severe weather. Growing up, she experienced a few tornado warnings that really solidified her fascination with meteorology. Of course, Julie has other interests besides her impressive meteorological career. As we mentioned before, Julie is a huge fan of puzzles. “I regularly watch Wheel of Fortune and solve The Washington Post “Samurai Sudoku” on a regular basis.” She’s also a big trivia person. Julie likes watching Jeopordy! and occasionally you’ll find her at a local trivia event. Julie also ventures up to MIT to participate in the legendary Mystery Hunt, which is a puzzlehunt that happens during the Martin Luther King Jr. Holiday Weekend. What Do Earth Networks Meteorologists Really Do? When you picture a meteorologists, what do you see? Many would describe a person sitting in front of a desk with multiple weather monitors. While that’s certainly part of it, it’s not nearly the whole picture! The Earth Networks Meteorological Operations Team is full of diverse people who love so many different things. 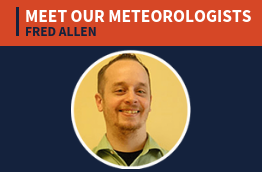 While Julie is super competitive when it comes to forecasting, puzzles, and trivia, Fred Allen is more of a basketball player. Just as each meteorologist is different, their daily responsibilities are as well. Julie’s main job is broken up into a plethora of different responsibilities, therefore she wears many hats. For example, one of her many jobs is to provide daily weather forecasts to various clients. Typically, these are short, 5-day forecasts but they can be longer. 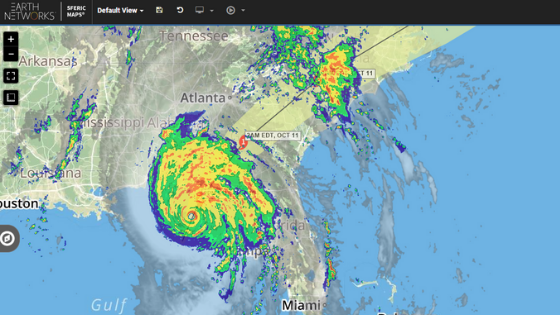 One of the longer-term projects she works on is the annual Atlantic Hurricane Outlook. It’s not all forecasting, though. Being a meteorologists is a very technical job. In her position, Julie also monitors data quality and performs quality control actions. She’s one of the people behind the scenes calibrating our data so our networks stay accurate and our customers can trust our networks. Julie’s also a bit of a marketing wiz. Her social media game is strong, as she creates and circulates interesting weather content as events occur. We’re tired just reading about all that Julie Gaddy does! 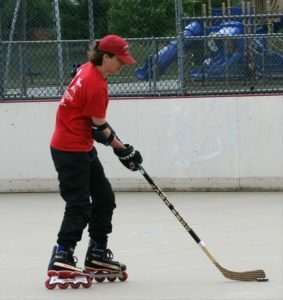 And, she makes time for roller hockey. With all of those responsibilities, it’s no wonder that Julie has a favorite type of forecasting. Since every type of weather system has its own challenges, Julie likes forecasting for 5 days out for any of them. She’s flexible, though. Snow seems to be a favorite of the meteorologist, as Fred Allen identified it as his favorite type of forecasting too! Some of our clients who care most about the snow are utility companies and transportation organizations, like the Montgomery County Department of Transportation. What Julie Gaddy and the rest of our team do on daily basis is more than a forecast, though. “I think it’s important to develop a relationship with each customer,” says Julie. After an event, Julie meets firsthand with the client to get feedback. This simple gesture often leads to an increase in overall interactions between the client and Meteorological Services Team. Now, the client gets more touch points and a higher value from us. 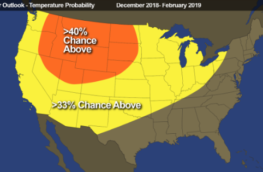 If it’s a puzzle for even the most experience weather experts, think about how difficult predicting the weather is for professionals in other fields! And yet, we see it quite often. Business continuity managers, emergency management crews, and even athletic directors play meteorologist and try to make the right call. No threat to your organization is more impossible to control than the weather. Weather and natural disasters cost the U.S. alone billions of dollars each year. Hurricanes, droughts, floods, and tornados are just some of the common threats that can halt business operations – and your finances – in their tracks. 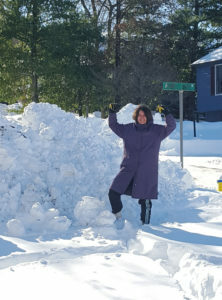 The trust between Julie and her business continuity and public safety customers is important when those clients are trying to make critical weather related decisions. Her professional guidance provides peace of mind to businesses that have everything to lose. If you don’t trust a meteorologists for these types of decisions already, how are you sure you’re making the right call? You can learn more about the MetOps team and creating a relationship with our meteorologists like Julie by clicking the link below. If you already work with Julie, why not drop her a nice note in the comments below or on social media? We’d love to hear any stories or comments you have about her or any other of the hardworking meteorologists on our team.